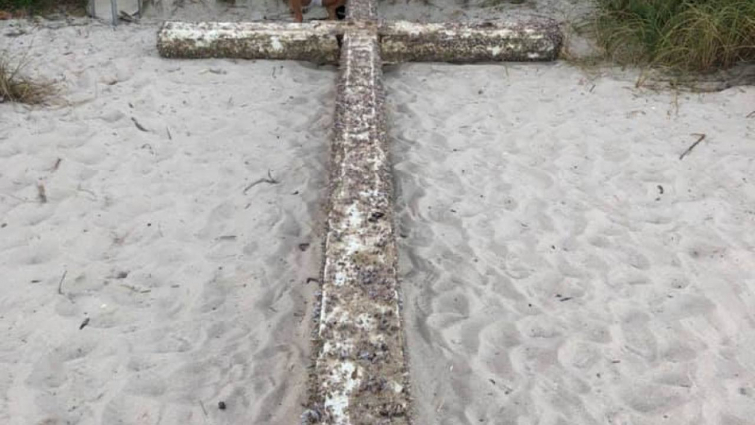 An old mysterious wooden cross suddenly washed up on the shores of a South Florida beach. A passerby saw the cross and lead to him renewing his relationship with God, reported CBN News. The cross washed ashore behind the Ocean Manor Beach Resort along Galt Ocean Mile in Fort Lauderdale over the weekend. "It is fantastic," Mary Ann Smolinski told the Sun Sentinel. "It's amazing. Very spiritual." Nobody knows where the cross came from. "People have suggested possibly Puerto Rico," John Moschella, who discovered the cross, told Fox 13. "Others have said the Keys. It's really unknown where it has come from." "while it could be a coincidence, the old wooden cross could also be a sign of God's protection"
The owner of the Ocean Manor Resort Hotel, Frank Talerico, said that cross might also be a sign of God. He was praying with his sister because she had a bad dream that night and right after they prayed they saw the cross on the beach. "She's like, 'You know what? It's not that big a deal. I just had a bad dream and a bad feeling, so I wanted to come here and pray,'" he recalled. "And I said, 'Okay, thanks for doing that.'" Soon after, the waves brought the cross to shore. "You know what? I'm glad it's here," Talerico said. "It's staying here and if anybody wants to come see it or take a picture with it, they're more than welcome." John Skorupa told the Sun Sentinel he had a spiritual revelation when he saw the cross. "I called up a girlfriend that I went to church with a few times and I said, 'Let's start meeting again for church services,'" he said. "I brought her flowers." John MacArthur's Church Attacks Steven Furtick: "He's Unqualified"